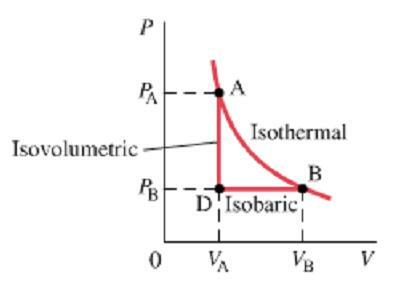 Isothermal - temperature is constant; no change in temperature, meaning no change in internal energy (U) by equation 1. Thus, Q=W for this process. Adiabatic - no heat is allowed to flow into or out of the system; thus, Q=0. Thus (change in U) = -W.
Isobaric - thermodynamic process where pressure is constant. The original thermodynamic equation holds for this process. Isovolumetric/Isochloric - process where volume doesn't change. Since there's no change in V, W=0 by equation 2. This makes (change in U)=W. The picture below depicts what each process looks like on a P vs. V graph. Notice how the isobaric process is horizontal (since there's no change in P) and how the isovolumetric process is vertical (since there's no change in V). Also notice how there's no work done in an isovolumetric process, since V is constant. For a more kinesthetic experience, please try out the applet at the bottom.